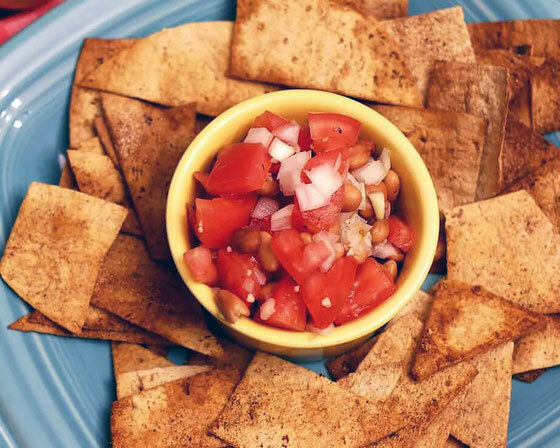 Get ready for Cinco de Mayo with this chips and salsa recipe that's actually good for you! It's made from flatbread! With Cinco de Mayo right around the corner, I have Mexican food on the brain. And while I like Mexican food a lot, so much of it is more than a tad bit greasy! So I started thinking about how to make a healthier version of one of my all-time favorite Mexican foods, chips and salsa. The biggest thing that tortilla chips have going against them is that they're traditionally fried. All the oil that they soak up makes them higher in calories: Each handful of traditionally made tortilla chips has upward of 100 calories and at least several grams of fat. I realized recently that I can easily make chips out of flatbread. To make the chips, you simply cut the flatbread with kitchen scissors and bake it. It's really that easy! For more recipes made with flatbread, take a look at my Cheesy Wild Mushroom & Caramelized Pizza and my Flatout Fruit Pizza. I decided to dip my homemade chips into a salsa made of tomatoes, onion, garlic, and pinto beans. All those fresh veggies provide lots of important vitamins and minerals, and you get extra fiber and protein from the beans. A squeeze of lemon juice adds a fresh burst to the recipe! 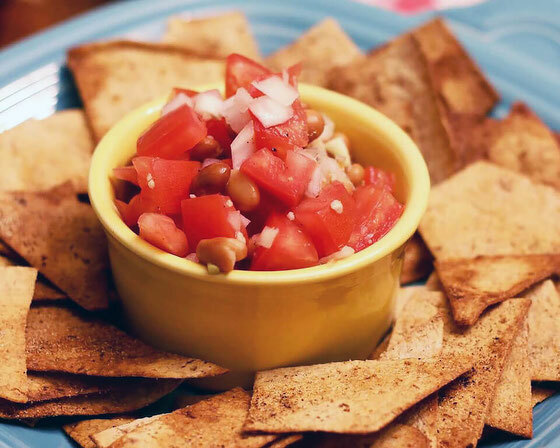 I hope you enjoy these healthier chips and salsa as much as I do! Preheat oven to 400° F. Treat two non-stick cookie sheets with cooking spray. Use kitchen scissors to cut flatbreads into chip-size pieces. Lay flatbread pieces on cookie sheets; coat with spray oil, and sprinkle with black pepper. Bake until crisp, about 5-7 minutes. 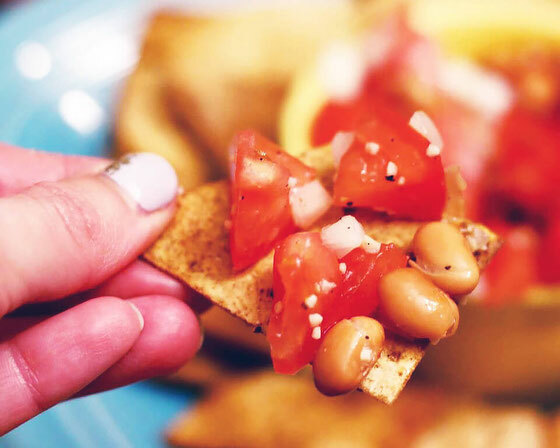 In a small bowl, combine tomato with onion, garlic, and pinto beans. Toss with lemon juice, black pepper, and salt. Serve salsa and chips together. Serves 4. What are your thoughts on this topic? What are your favorite ways to celebrate Cinco de Mayo?